Brian Hicks, project lead on DayZ, stopped by the PC Gaming Show at E3 to talk about the progress and future of the multiplayer survival game, which has been in Early Access for over a year and a half. 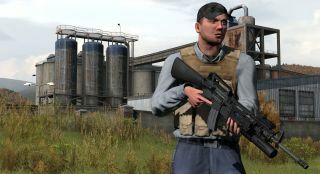 In addition to plans in the near future to release three more vehicles and the resources needed to repair them, Hicks said that a single-player feature for DayZ was in the works. This will allow gamers to play DayZ offline, and also allow modders to test out their custom content in local sessions. Speaking of mods, Hicks said DayZ will be fully embracing the Steam Workshop. Finally, Hicks told us that Bohemia will be releasing the tools needed for players to host their own servers, a feature DayZ players have been asking for almost since the game appeared. None of these upcoming features were given delivery dates, however.